Normal chests appear as Wooden, Silver, or Gold depending on the exact item rolled/contained. Blue Chests are rewarded based on contribution. Getting more honors during the raid linearly increases the drop rate. Available only in Grand Order (Raid), Proto_Bahamut_(Raid)#Impossible, Impossible Omega Raids and Impossible Omega II Raids. For Impossible Omega II Raids, an approximate 10% damage of HP is needed to guarantee a blue chest. For Akasha (Raid), an approximate of 12.5% of the total contribution to the raid (about 1,500,000 Honor) is needed to guarantee a blue chest. Most chests have internal drop rates, causing some items on their loot list to drop more or less often. As a result, some items are rare due to the rarity of the chest that contains them, while others are rare outcomes from common or even guaranteed chests. The main difference between them is that the former can benefit from drop rate boosts. Drop rate boosts have no effect on which item you receive from a given chest, only whether or not a chest appears. The table below contains all verified drop rate boosts. Optimal boosts have been highlighted for quick reference. Dragon Bar V ~3% At SL10. Despite showing +2, multiple copies do not stack. Septian Burner (mainhand) ~3% At SL10. May be below 2.5%. Oliver (mainhand, all stages) ~5% Includes Rebirth, Ventus, The Storyteller, etc. 20% Higher levels of Bounty Hunter are harder to apply but also more rewarding. As drop rate boosts only affect the chance a chest will drop, guaranteed chests (including Host and MVP chests) do not benefit from drop rate boosts at all. Chest contents are unaffected by drop rate boosts. Drop rate boosts are multiplied against the base drop rate of a chest. A 1.5x drop rate boost would cause a chest with a base 2% chance of dropping to instead have a 3% chance to drop. When farming items with higher base drop rates, drop rate boosts have a more noticeable short-term impact, but they can be equally (if not more) valuable for farming rarer items over a large number of attempts. Either way, drop rate boosts are especially valuable when leeching, as the majority of drops will come from non-guaranteed chests rather than Red chests. 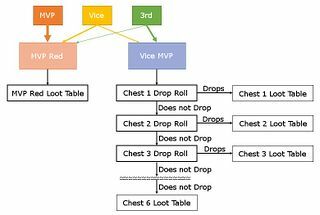 In short: Vice-MVPs can potentially receive anything on the drop table except the Host chest. Some item drops (usually high-quality treasures or SSR items) result in a special animation: a gold chest that performs a little flip under a rainbow while playing a special sound. Share Chests are awarded to the Host (Discoverer) of certain raids (such as Grand Order, HL Proto Bahamut, and Impossible Tier 1 Summon Raids). A Share Chest has two or three slots; each slot rolls to determine which (if any) items are available. The host and each member of their crew who participated in the battle may select one available item to roll on. If nobody from the host's crew participates in the battle, the host can still select an item from the share chest. Player rolls range from 1-999 and cannot tie; whoever rolls highest on an item receives it. Roll values are also random and have no correlation to raid honors. The Share Chest lasts 10 minutes or until all players have rolled, at which point remaining items are forcibly distributed or discarded. A player cannot receive more than one item even if some items are unclaimed. A player cannot be part of more than one raid with a Share Chest active at a time. Due to the material cost of hosting raids with Share Chests, it is usually considered bad etiquette to roll against the host unless explicitly invited. Players can pass on Share Chest contents if no items are desired or an item was rolled for by mistake. It is often difficult to tell in-game what a chest contains (or even which chest dropped). Drop tables help demystify which items are guaranteed, rare, or compete with one another, which is useful for better projecting acquisition rates for particular items or the usefulness of drop rate boosts for particular battles. Tables will often have drop rate values listed. This page was last modified on 6 April 2019, at 00:05.